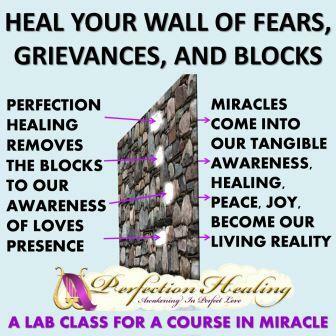 One could say: If "A Course In Miracles" (ACIM) & A Course In Love (ACIL) book was the lecture study... then Perfection Healing would be the lab class work of exploring and applying the principles learned. In this way, students of ACIM learn through tangible experience that everything taught is Absolute Truth. How? By entering the Lab Class to ACIM/ACIL, where you are taught directly by your Holy Spirit, identifying and removing the blocks to love's awareness. And it is this awareness that heals, that demonstrates the tangibility of miracle correction. Here, you will learn how to boldly go deeper within Course instruction. Here, you learn to actively practice and experience the Holy Instant, which is where the 'shift in perception', from humankind's laws to God Laws of Love. Here, you will be guided in retracing the mistakes where ego-antics-energized are blocking your Perfection, blocking your natural inheritance, blocking the Awareness to being Love's Presence—Right Now—. Here, the Holy Spirit shows you tangibly “your Perfection”…healing, correcting, what never was… the negative illusions of mind, body, and spirit. "This is a course in miracles. It is a required course. Only the time you take it is voluntary. Free will does not mean that you can establish the curriculum. It means only that you can elect what you want to take at a given time. The course does not aim at teaching the meaning of love, for that is beyond what can be taught. It does aim, however, at removing the blocks to the awareness of love's presence, which is your natural inheritance. The opposite of love is fear, but what is all-encompassing can have no opposite." 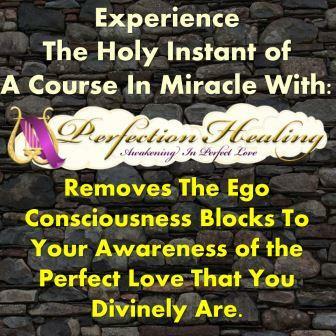 1st StepMaster Living In The Moment - The "Holy Instant"
2nd StepExperiencing Your Perfection Through Miracle Healing. Perfect Love is uncompermized Love, the Quantum Love of Our Creator. This Love is Quantum in nature and thus scientifically ever present on every imagined level. Being Quantum and Being of Our Creator, both in Image and Likeness, it is Our Birthright to experience in our everyday lives. It is a fact, a Truth beyond humankind's imagined fictions. It is a fact Perfection Healing was given to prove. Three Steps To Your Eternal Freedom! 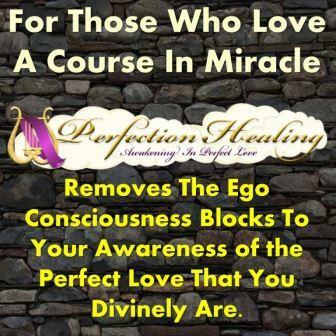 Perfection Healing is the process of experiencing what the book, A Course In Miracles callsthe Holy Instant. This Instant is the Miracle of Quantum Love that holds together the universe and thus, is more than capable of changing it. This change comes in an instant that is purely Holy and Powerful beyond Human understanding... that is understood once it happens. And Our Healing Becomes Complete." “… I was able to release long-standing emotional pain so I could get on with my life with more clarity & love.” T.N. “… was most amazed by how I felt after each session. I've experienced instantaneous headache relief and my backaches and shoulder pain are gone.” C.W. “…. For me, the instantaneous release of pain that has happens when I do the work is beyond words.” A.E. “… The results of each session were immediate and I felt a profound release of toxic emotions literally leave me. You can feel this both spiritually and physically.” M.P. “… I have notice positive changes in my stress, my thinking and my overall view of my life.” H.D. “… I was very surprised at the fact that I experience very real and tangible results.” Q.P. "Lab Class Practice" contains 3 Key Elements To Awakening!